What makes AYST a better choice than our competitors? Our company was founded with one goal in mind: to not lose a single customer due to dissatisfaction with our services. We have not failed in our mission yet. As a smaller local company, we stop at nothing to make sure our customer’s best interest is in mind at all times. When you contact us on the phone with an issue, it’s a conversation, not robotic answers and hours on hold. When you reach out to us with additional needs, we don’t try to sell you everything in the book for a profit on our end. We listen, and try to find the best fit solution for your problem. We strive to build relationships with our clients, because we understand the importance of building a rapport of trust and familiarity. On the other side, take a look at our engineers and technicians and you will notice that they are masters of their craft. They are professional and knowledgeable in everything they do. Always remember to stay vigilant, stay secure and contact us today to upgrade your protection! There are three main types of cybercrime that you, as a business, or consumer, should be on the lookout for. Furthermore, here are some ways to protect yourself against cybercrime and identity theft. 1) Financial- If you notice suspicious activity on your credit card or bank statement, contact all financial institutions where you hold accounts and place a 90-day fraud alert on your credit reports. This should be done through all three major credit reporting agencies individually. This prevents identity thieves from opening new accounts in your name. Furthermore, protect your social security number, and don't give it out over insecure channels ever! 2) Medical- Your health insurance information can be used by someone else to see a doctor, get prescription drugs, and file claims to your insurance provider. Estimates show that 1 in 3 Americans were victims of medical identity theft in 2017. To mitigate this, read all medical and insurance statements carefully, and if something looks unfamiliar or off to you. call your health insurance customer service number to cross-reference your information with theirs. If someone has used your information, contact your medical providers immediately! 3) Online- A sharp increase in social media use means greater opportunities than ever before to steal identities or information online. Avoid "oversharing"- each time you make a social media status update, think about whether it could be used to compromise your privacy or security in any way. SaaS applications have changed the way employees and organizations operate, how an application is purchased and provisioned, and how employees access and use the apps. Today, IT departments are no longer a part of this process. As a result, security gaps arise due to the lack of sufficient control and visibility for which applications are hosting corporate data. Are users are the biggest threat to your systems? The IT department can lock down anything it wants, but all it takes is one careless human to cause a destructive breach. In a mobile society where everything is connected, human beings are truly the Achilles’ heel of security. How do you mitigate those threats. Should we have procedures in place? These are some of the questions you should be asking. Some of the biggest System Infections have been caused by a single USB thumb drive with Malware; Which a random employee picks up and plugs into their work station causing massive infection. With proper training users can be mitigated to become a minor threat. AYST follows a multi-layered approach to cyber security. Contact us Today to setup your Site Survey to learn how to protect yourself, your company and your data. Do you have the latest Windows 7 and Server 2008 updates? Windows 7 and Windows Server 2008 users need to have SHA-2 code-signing installed by July 16, 2019. Otherwise those systems which utilize Windows 7 and Server 2008 will not get Windows updates after that date. Microsoft issued that warning on February 15. Windows operating system updates are dual-signed using both the SHA-1 and SHA-2 hash algorithms to prove authentication. However due to "weaknesses" in SHA-1, Microsoft officials have said previously that Windows updates will be using the more secure SHA-2 algorithm exclusively. Customers running Windows 7 SP1, Windows Server 2008 R2 SP1 and Windows Server 2008 SP2 must have SHA-2 code-signing support installed by July 2019. officials have stated. On March 12, Microsoft is planning a standalone update with SHA-2 code sign support for Windows 7 SP1 and Windows Server 2008 R2 SP1. It also will deliver to WSUS 3.0 SP2 the required support for delivering SHA-2 updates. Microsoft will make available a standalone update with SHA-2 code sign support for Windows Server 2008 SP2 on April 9, 2019. On June 18, Windows 10 updates -- 1709, 1803, 1809 and Server 2019 -- will have their signatures changed from dual-signed SHA-1/SHA-2 to SHA-2 only with no customer action required. Fake “unlimited” plans, bogus fees, and simply not providing promised speeds, companies like Verizon, AT&T, Comcast, and Spectrum have been using questionable claims and branding to spin their customers for years. All of these companies are attempting to fool us. When 5G is here, we will all know it. You can make sure you find out by Following us on Facebook and Linkedin. This is arguably one of the most popular Internet privacy myths. Many people have been misled into believing that the private browser mode can protect them against spies. The truth of the matter is that private browsing only disables your web cache and browsing history. Even though this keeps your online history private, it won’t stop your online sessions from being monitored. Spies can still capture information about you and use it to identify your IP address and all websites that you might have visited during your browsing session. Many people believe that hackers only attempt to intrude the computers of large corporations or rich individuals. This is a false notion considering that millions of devices are connected to the web and therefore, anyone can fall victim to hackers. Besides getting your Internet privacy intruded, you can be unknowingly recruited by hackers online to form part of their zombie computers. This enables them to undertake DDoS HYPERLINK attacks and steal data on millions of devices. In this case, you will unknowingly be part of the hacking network. What’s in store this for this year’s CES Show? Each year the Consumer Electronics Show shows of the latest emerging tech in multiple fields. We are going to break down what you can expect see and hear in terms of news. Expect things like companies adopting Intel’s latest processors, NVidia’s latest GPUs, and probably some increased competition from AMD on both of those fronts. Foldable devices are going to be a big thing. Multiple device makers plan on showing off a foldable of some kind, though some of those demonstrations will be behind closed doors. Important sets will come from LG (rumored to be preparing a consumer version of its rollable TV), Samsung, Sony, TCL, and others. Expect to see more big screens from all these manufacturers. Do I need to shut down my computer at night? This goes all the way back to the early days of computers. Early computer parts, especially hard drives, wore out much faster than they do today. With that said, the idea was that to make your computer last longer, you should always shut it down at night. Some people still cling to that concept, and there is a little grain of truth in it. Modern computers have more robust parts, which means you can let them run with little to no problem. Whether you shut down your computer nightly now just comes down to personal preference. If you want your computer to do things like backup, update or other intensive tasks, you can schedule them at night while you are not using your system. There are many different power option settings you can use. Check power options in your control panel to see the many options available. Do I need to defragment my hard drive? This is a myth that used to be true, but no longer is. Given the way conventional magnetic hard drives read and write data, over time bits of data that should be next to each other get jumbled. So, to pull up a file, the drive would have to travel to 15 different places instead of one or two, which slows down your system. It used to be that you'd occasionally need to manually run a utility to defrag your system. Now, that function is built into Windows and other major operating systems, and it's run automatically as needed. There's no need for you to do a thing. In fact, defragmenting can even cause a problem if you're using a solid-state hard drive (SSD). Not only do SSDs not have fragmentation problems, the memory cells are only good for a certain number of reads and writes. Running a defragmenting program just wears out your drive faster. Are Password protected networks safe from hackers? No network can be assumed to be totally protected from hackers and their amazing variety of code-cracking tools. Even carefully composed passwords can be eventually cracked. If you use a hard-wired office network, assume that anyone on the network can potentially see anything on your computer. This is even truer for Wi-Fi networks. Wi-Fi has become so ubiquitous that people routinely access the Web and their email in airports, hotels, restaurants and even planes and trains, all of which can be penetrated by a dedicated hacker. You can improve your protection by encrypting what’s on your computer and by using very strong passwords with upper- and lower-case letters and a variety of symbols, none of which should resemble a word. But the only way to completely protect bank account, bank and Social Security numbers is to never enter them online. Also, keep in mind that some hacks can block access to your computer. That’s good reason to keep a backup copy of everything on a removable drive kept tucked away in a separate location. While you can also back up to a cloud site, should that site go down or be hacked, you will still have your removable drive. Is private browsing actually private? Every web browser has a private mode. When private browsing mode is on, the browser won't record where you go and it wipes most of the information someone using the computer could use to piece together your online travels. In Microsoft Edge, Internet Explorer, Firefox and Safari, you enter private browsing mode using the keyboard shortcut CTRL + SHIFT + P (CTRL + OPTION + P on Mac). In Chrome, you use CTRL + SHIFT + N (OPTION + SHIFT + N on Macs). What you might not know is that private browsing isn’t foolproof. It doesn't hide your browsing history from your internet service provider, the sites you visit or any law enforcement that may happen to be watching. What's the best Home Wifi? This is a question we have been asked multiple times this last week. It’s a bit of a loaded question; We say this because most people don’t care how their WiFi works just as long as it does. With more devices being connected to your home network every day; a good Wi-Fi system, will alleviate most problems you meet. While AYST deals with business level networking and support, we are at our core consumers just like you with a bit of a difference. We like to have capability that a Business level WiFi system can provide as well as the difference in support. Business systems tend to be very pricey and can carry a support contract with them to ensure they have the latest Wi-Fi standards are met as well Top Level support. There are a few less pricey options, which allow some advanced networking features at the consumer level. The one thing that every home should start using is something called a MESH WiFi System. These systems allow you to place multiple Wi-Fi points throughout your home and seamlessly transition between them without ever losing your signal or having to reconnect. To find out more about Mesh Wi-Fi Systems and other Technology related news follow us on Facebook! Did you get your deals for this holiday season? With the tide of the holiday coming ever closer, now is the time to ask yourself "Did I get the best deals for Black Friday and Cyber Monday?" Don't fret, most retailers are still offering fantastic deals. Online retailers like Amazon and New Egg still have their sales going through to the 1st of December if not longer. Deals are always great, but sometimes they are outright lies. (Buyer Beware), In 2017 there was a 127% spike in phishing attempts as well as stolen user information from "deal/coupon" websites. Your data is collected through a fake online survey promising a large discount coupon or free items. You should never trust one of these. Instead purchase directly from the retailer to ensure the things you buy are what you're paying for. In addition: don't forget to have a Great Holiday Season and to stay safe with your personal data. We here at AYST believe in Proactive Preventative Action to prepare you and your network for the worst-case scenarios. In doing so AYST also takes steps to ensure that your data and configurations are being backed up to multiple locations for redundancy. If you or your company is concerned that your IT security isn't up to snuff, then give us a call today to schedule an AYST On-Site Survey and Technology Audit. As we get ready to move into this holiday season there is a lot of technology going on sale. There are many deals happening at all major retailers. Now is the time to get your home Wi-Fi upgrades taken care of as well as some other things you have been putting off. If you’re in need of a Network Attached Storage (NAS) device for having your media and photos on hand at all times or in need of a new computer. Please don't forget that all of these devices have deals and its best to shop around before you buy what you want. One of the main things most people forget to think about is how to grow their home in way for the future. Mesh Wi-Fi is becoming the standard for homes as it allows seamless transitions between each Wi-Fi access point and allows for further expansion with the ability to add more access points as needed. However, there are caveats to this as well with anything else. If you’re a tinkerer like all of us here at AYST you need something with advanced networking features, if that sounds like you, give us a call today to see if we can help! Why Power Cycling your Devices is a good thing! We can almost guarantee that over the years you’ve heard the phrase "Unplug it for 30 seconds then plug it back in." Well there’s a reason this actually works a lot of the time. Don’t misunderstand us, there are times where there is more of an issue and it must be dealt with accordingly. In the world of everyone having multiple devices they own, many different things can happen that can cause a device to "hang." which means that’s it’s stuck. Doing something as simple and powering off the device for 30 seconds clears the state that the device was in allowing it to be functional again. This also does many other things including clearing any held cache and cookies(dependent on the device rebooted) as well as allowing the capacitors which reside in almost every electronic device to discharge which could solve a power issue. All in the very 1st basic step you should take should be to power down and or unplug your devices for 30 seconds and then try again. Most people don't bother to regularly maintain their computers. By maintain we don't mean regular updates. One of the things most people don't ever do is blow out or vacuum out the dust collect inside their computers. For most this never crosses their minds however, not cleaning the dust out can lead to actual hardware issues. Such as overheating and possible fires. One of the other most forgotten things done is updating the actual hardware within the PC. Things like a BIOS or DRIVER update can drastically improve the stability of your hardware. Thanks to technology, the IT landscape has changed. A department formally tasked with “come-fix-it” problems has crawled out from the shadows to become a pioneering leader in charge of devising strategies for leveraging technology to support business goals, essentially, answering the question “How can technology and the Internet make this faster, cheaper, and safer?” In fact, according to Harvard Business Review Analytic Services, 57 percent of organizations view IT as an investment that fosters innovation and growth. Businesses are welcoming the change. The pressure of innovation is a huge undertaking for a growing organization’s IT department—especially when budget is a serious concern (which it inevitably always is). Unfortunately, many businesses hesitate to ask for outside help from a managed services provider (MSP) due to a few common misconceptions. AYS Technologies can help build the strategy and assist in making key decisions needed in order to benefit a business as a whole. AYS Technologies is an information technology company founded upon the principles of honesty, transparency, and innovation in our field. We strive to consistently provide outstanding service to our clients, and we have the track record to prove it. When should I upgrade my equipment? With new technology emerging multiple times per year it can get confusing on when to upgrade your equipment. While upgrading to the latest technology is an absolute must for some, it is not the case for most people. Most people wait until there equipment breaks or becomes unusable due to how long the equipment has been used. With most things of today everything has an expected amount of "life' to their equipment. While this is may be true. Here at AYST we find it best to keep system upgraded within a specific "cycle" to ensure that equipment is never too far behind the latest tech. If you think your equipment is need of an upgrade give us a call today! Information is becoming ever greater in society and it is important that there are standards in place to ensure the most basic layer of security is being followed. If you’re a business owner this is most likely a conversation you will have with a governing authority as not following those guidelines can lead to very large fines. With At Your Service Technologies we have the tools needed to ensure your business is 100% compliant. We build customized user-friendly reports tailored to your specific business to prove your compliant with the State and Federal governments. If you want to ensure your business is compliant call us now! We can schedule a visit to come onsite to your business and run our custom tools to provide you with each vulnerability to your network and we can resolve them as well! Don’t forget to stop by our Facebook and LinkedIn pages and give us a follow to stay up to date with the latest Tech News! Why having a good password makes a difference? Why having a good password make a difference? In today's age of ever-changing security threats, we need to remember that your online passwords are of extreme importance. Here's a few things to remember to ensure you’re on the right the path. Password length matters, what we mean by that is if your password is only a few letters long it means that a computer with the correct program can and will break your password combination within minutes. Most sites today ask for a minimum of a combination of 8 letters and numbers. This is for a specific reason. The more complex the password the longer it will take for the same program to break your password. This is why a mix of number, letters, capital and lowercase letters are recommended. A simple password like 1111 will do nothing to help protect your valuable information. While a password with a slew of mixed characters can be almost impossible due to the amount of calculations needed. Are you prepared for future growth? Are you prepare for future growth? In this age of IOT and up to 50 billion devices being compatible with the internet, most people forget to prepare for the future with their devices. Businesses preparing for future growth is of the utmost importance. Each and every device that you use every day can and will break eventually. This is why preparing for the future is so important. Do you want to be stuck in "Re-Active mode" where when problems arise only then you deal with them at that moment? Or would you rather be "Pro-Active" meaning to be prepared for the worst possible outcome and ready to resolve the any issue within moments. With At your Service Technologies customized IT Roadmaps, you can prepare for each issue that may arise as well as the future growth of your systems and its needs. We can help you understand the weak points within your network as well as work within your budget to ensure you get the best hardware, software and support possible for your IT Initiatives. Why is it important to replace your UPS Backup Batteries? In the world of IT, every engineer, and administrator and most in Tech Support know what a UPS battery backup is. Well for those of you, who don’t know, UPS in an acronym for Uninterruptable Power Supply. What this means is that in the event the power goes out to your system the UPS will take over the power needed for the equipment so it can be safely shut down without damaging the physical equipment itself. With this in mind a UPS is a standard used to ensure the longevity of your equipment from power surges or sudden loss of power. Every so often replacement batteries get left to the wayside as a non-critical piece of equipment. While some may believe this to be true; they must understand that there is a battery within the UPS continually cycling power throughout to ensure its charged in case of a power loss. Like all batteries; you can only rely on a battery holding charge for so long. If these batteries get forgotten or left alone they will not hold a charge for very long and will begin to swell. If that continues to happen the physical batteries will fail and cause not only the loss of physical equipment but it could be a possibility that it can cause a fire in the most extreme of cases. As time progresses; most people have begun to ask "is automation a bad thing?" This same question was asked when Henry Ford perfected the production line. With every great innovation come obstacle’s we must hurtle in order to allow change to happen. As automation becomes more prevalent in our digital society many aspects of our lives will change, from how we work to how we live each and every day. With automation taking certain jobs its allowing for growth in different aspects. We are beginning to move from the idea of "I have to go to work to earn a living" to "I don’t need to work to live". With the allowance of free time will blossom learning throughout the world as time will be available to learn whatever we want to learn, whether it’s helping other people to learning how to create the systems of automation themselves. We are in for some exciting things for the future. Don’t forget how far we have come! In today's day and age of everything digital its very simple to forget how fast new emerging technology has arrived. In the early 80's there were computers the size of small buildings. In the late 80's began the emergence of Personal Computers that could fit on top of your office desk. At the same time as the desktop Personal Computer; the "Laptop" started to appear. At the time however it wasn't much of a "Laptop" as they weighed about 20 lbs. Now we start to look at the late 90's. Where personal computing began to have specific parts designed to enhance certain applications within the computer itself, while at the same time Laptops began to get much lighter and more compact. A look at today shows us that Personal Computers are in just about each and every home. A very large percent of the world's population walks around with a 'smartphone' in your pocket. What most people fail to realize is that thirty or forty years ago these types of devices would even exist. Technology health check-in: When is it time to take a hard look at your IT system health? These are the things that the average employee has almost certainly muttered to themselves in the course of their work day when referring to their PC or IT system as a whole. There are some telltale signs and red flags that can be observed that indicate it is time to take a look at upgrading your system. Self-Help Trouble Shooting: What to do if you run into trouble with your PC. Sometimes, you just don not have the time to deal with submitting a ticket or giving your IT company a call. You need a solution fast. Perhaps your IT company’s turnaround on the ticketing system is slow. What Now? Never Fear…There are a few things you can do beyond smashing your PC with a hammer that will likely help to fix the issue. If it is an issue with a specific program, open the task manager on your PC and shut down the program. An isolated shutdown, followed up by a check to see if the program needs to be updated, could be what gets your program back up and running and you on your way. If it is systemic – meaning the issue has to do with the entire system – perhaps you need to go the ol’ “Power off and on” route. Shut down your computer fully (do not just unplug everything-shut it down through your OS!) Wait about 30 seconds, and then reboot. This allows the OS to run a thorough diagnostic and update if need be. If it is an issue with your internet, do the same with your router – unplug and wait 10 seconds, then plug it back in and boot it up. Usually that will cover a good portion of the issues you may have. Physically cleaning machines removing internal dust that can cause overheating and crashes or hardware failure. Install and run various clean-up and rootkit/malware detection software on each machine. Clean up user profiles and delete those that are unneeded. Optimize each machine for performance on the network. Perform network audit on the server(s) and key devices. While medium and large sized enterprises do not usually rely on one single backup solution without redundancies, many small businesses do. This is especially the case with Solopreneurs, like photographers, who in many ways mimic the behavior of the consumers. Industry experts, warns that anyone relying on an external hard drive as a backup strategy could be in for a rude awaking. Most consumers assume backing up to an external hard drive is enough. In reality, you should have multiple backups in multiple locations. Additional backup solutions could include DVD copies stored offsite in a secure location, regular backups to a cloud storage provider, or if you have multiple locations, site to site replication is an option. Finally, a Hybrid of on-premise and Cloud hosted backup, provide the best of both worlds. This may have been good advice back in the days of nickel-cadmium batteries, but modern lithium-ion and lithium-polymer batteries don’t suffer any harm from being left charging for long periods. In fact, lithium batteries last longest when you keep them between 40% and 80% charged. Also, if you let lithium-ion batteries discharge completely for too long, they can be permanently damaged or become dangerous, so you are better off keeping them plugged in than letting them drain completely. Lithium-ions do have one polarizing challenge: The batteries have a built-in sensor that tells your gadget how much electricity is left in the battery, and overtime, that stops matching up with the battery’s actual charge. To reset it, you have to charge the Lithium-ion battery to full, let it run down to the point where your device gives you a serious battery warning and then charge it back up to full again. However, this only needs to be done every 3 or 4 months or so and for some devices, you may not need to do this at all. Apple used to recommend this this process, but now says it’s no longer needed. Please check your device’s manual to see if it has any specific directions. IT Myth #9: “ALWAYS Shut down your computer at night before leaving work. Back when computers were new, Parts used to wear out muck quicker than they do now. Hard drives especially were not as robust as they are today. In order to make these components and ultimately your computer, the advice was to shut your computer down every night. However, Things have improved. Components are better built and designed to last, and you can now safely leave them running with very few problems. Whether or not you want to shut down every night comes down to personal preference and overnight can be a great time to schedule updates, backups and other system tasks, so these tasks don’t disrupt your working day. If you leave your computer running, it is using energy, so either turn it off while you are not using it or use a power saving mode. It is also worth noting that patches and software updates often don’t install until the computer shuts down and is restarted. Finally, if the computer is grinding to a halt then a reboot will often bring it back to normal. A 64-bit OS isn’t inherently faster than a 32-bit OS. If you upgrade an older PC, you won’t see any performance boost from the OS alone – but it does enable certain advances that were not possible before. The main advantage is that it allows the OS to recognize more than 4GB of RAM, which can be a huge benefit when running intensive editing applications. It depends on the software too, the real jump in power comes from the software designed with this architecture in mind. AYS Means IT " At Your Service"
Common sense is certainly an essential element of your battle with viruses, malware and data privacy compromises. In fact, many online can be avoided by following a few simple rules. Don’t follow links in spam emails, don’t click on downloads from unknow sources, don’t enter your password unless you are certain that you are on the right site and make sure you keep up to date with patches for your operating system and applications. “Common sense alone won’t keep you completely safe” Cybercriminals regularly unearth “exploits” that allow them to sneak their malware onto your system silently. By hacking into respectable servers, they can even turn innocent-looking sites into malware distribution channels. If you are not running antivirus software that can intercept the malicious code as it arrives on your system, you are a sitting duck, no longer is this scenario an if… it’s now become a when. At Your Service Technologies has been named “Webster Business of the Month” by the Webster Chamber of Commerce for September 2018. We here at AYST are incredibly thankful for the honor of being recognized as a leader in the community. We strive every day to be the honest and transparent IT company that not only advocates for our clients, but works to provide the best service possible day in and day out. AYST wishes to thank all that had a part in making this happen. The Mac operating system is a particularly challenging one to attack as it is based on Unix, one of the oldest and most secure operating systems available. Fewer people use macs, which both makes them a less attractive target and restricts the spread of viruses. It also means that any attacks that do occur are often less widely reported. If you have bought a mac so you don’t have to worry about security, the bad news is that since around 2012, Macs have seen a huge upswing in all manner of threats – Malware (including spyware, keyloggers, backdoors, and more), adware, and potentially unwanted programs (PUPs). Malware labs report that, as of early July 2017, there has been an increase of 230% in Mac malware over the last year alone. Even worse, that only tells a small part of the story. Adware and PUPs are increasing at an even higher rate, with even the Mac App Store suffering a tidal wave of Scam Software. IT Myth#5 " The most expensive solution will solve all our problems"
This is more of a train of thought than as opposed to an actual expression. It is based on the belief that the best hardware and software will correct the ills of a company. The belief that technology, not management will solve problems is just as prevalent today as when the computer was first introduced. It is fascinating to watch companies throw millions of dollars at solving a problem through technology, yet balk at spending money for management, a sort of “penny-wise and pound-foolish” mentality. Corporate management genuinely believes that I.T., management controls and tools can be developed inexpensively, if not free. To some companies, technology is purchased more as the latest status symbol, as opposed to its practicality. It is purchased more to “keep up with Jones” than anything else. What they don’t realize is that the Jones’ are in as much trouble as they are. “System design as an exotic art form” is what you hear most often. Most system developers like to be viewed as free-spirited souls who do not like to be encumbered with organization, discipline and accountability. The fact is, many of these so called “Rembrandts’” are nothing more than lousy house painters. They hide behind the mystique of their technology in hopes it will conceal their poor performance. System design is a proven and teachable science. This is not to suggest that the science lacks creativity. For example, there is considerable creativity for the sciences of Engineering, Architecture and Network Mapping etc. Science simply establishes the governing principals and rules observed in your work. This is a common factor when bringing in outsourced IT services to a company that already has a dedicated IT department. It is a defensive expression that springs up whenever change is mentioned. It must be clarified that when a worthwhile IT company is brought in to consult or supplement onsite management of an IT system, it is just that: supplementation and consultation. Sometimes, in-house IT professionals see this as a threat or affront to their jobs or capabilities, and that simply isn’t true. Managed onsite services and proactive work can be the perfect supplement to an onsite IT team, allowing your company to run smoothly and your in house IT professional to sleep soundly at night knowing someone has his back. IT Myth # 2 "We don’t have enough time to do this correctly"
This Implies “we have plenty of time to do things wrong” There in an interesting relationship between the quality of a product and the speed by which it is developed. This phenomenon is true of any product being built. The faster the delivery of a product means the greater the chance of inferior quality. The slower the delivery, the greater the chances are for superior quality. Neither extreme is acceptable; an even balance must be maintained to assure one does not have an adverse effect of the other. Instead of developing a long range plan that incorporates an information strategy, management nurtures the problem by saying the need everything “yesterday.” Software vendors prey on companies like this by offering miracle products promising to accelerate development while producing quality results. Without the appropriate management environment, they deliver neither and compound problems further. These tools concentrate on efficiency, not effectiveness. Before you can streamline your operation, you must first know what you are doing. That is why our roadmap, fit assessment and site survey process is so incredibly important. Many managers will be the first to state that their problems are unique to their company. They point at the overwhelming pressure they operate under, uncooperative users, and some cultural constraints. In many cases, we at AYS have seen separate companies, geographically separated and in different industries, completely exclusive of one another, both describing the same problems, yet viewing themselves as unique. Frequently, many companies end up in a “fire-fighting” mode of operation constantly patching problems. In this case, it is best to bring in third- party IT support in order to mitigate these issues. That is where we come in. Backup solutions come in all shapes and sizes: hosted backup, cloud, onsite cross-covering backups, etc. It is important to remember that if you are a business with multiple locations you should have a backup in every location of your enterprise. Furthermore, this backup shouldn't just be for that one location; it should store everything from all possible locations of your business. In that case, if something happens at one site, the other site(s) have you covered. Cloud backup is another solid option when it comes to keeping a plan B for your information, but with cloud storage one can begin to run into limitations on the amount of information that can be stored and the privacy of your data. If pursuing this route, proceed with caution. In this day and age, most, if not all, major IT companies have a 24/7 reporting and ticketing system. The purpose of this apparatus is to allow for the fastest possible response time to everyday issues that the client (you) would run into with their IT system. 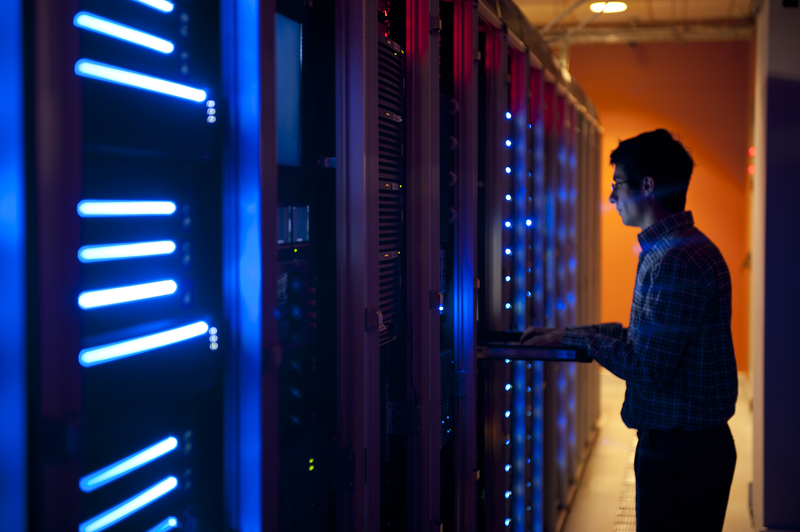 It is vital to ensure your IT services provider operates in tandem with a 24/7 system. However, beyond this piece of advice there is another thing to watch out for- beyond the existence of a 24/7 system itself- that the company you choose to provide your onsite services has a low response time to individual problems and tickets. What is a low response time, you ask? The best possible time would be under an hour. Here at AYS, our average ticket response is less than 30 minutes, far below industry standard. Beware from large companies that look like they would have a short response time: always ask during initial meets with prospective IT companies what their response time is and ASK FOR PROOF. It pays to be stringent with your expectations- this is your time and money invested! Local business has long been the staple to a strong economy, an abundance of trust, and quality of service. This applies in almost any industry, including the world of IT. What makes us a more solid choice than our larger competitors, then? We strive to build relationships with our clients, because we understand the inportance of building a rapport of trust and familiarity. Next time you have an issue with your IT systems, do yourself a favor and go local- you won’t regret it. It’s easy to think because you have a small to medium-size business, cybercriminals will pass over attacking your company. The “not much to steal” mindset is common with small business owners in regards to cyber security, but it is also completely incorrect. In reality, the U.S. Congressional Small Business Committee found that 71 percent of cyber-attacks happened at businesses with less than 100 employees. Even more concerning, the 2016 State of SMB CyberSecurity Report by Ponemon and @Keeperfound that 50 percent of SMBs have had a security breach in the past year. But why are small businesses attacked more often than larger businesses? Almost all cyber-attacks are to obtain personal data to use in credit card or identify theft. While larger enterprises typically have more data to steal, small businesses have less secure networks, making it easier to breach the network. CSO.com by IDG’s article “Why criminals pick on small businesses” says that by using automated attacks, cybercriminals can breach thousands or more small businesses, making the size less of an issue than the network security. The CSO.com article says that lack of time, budget and expertise for proper security is a top reason for the high rate of SMB attacks. Other reasons include not having an IT security specialist, not being aware of the risk, lack of employee training, not updating security programs, outsourcing security and failure to secure endpoints. 1) One of the first lines of defense in a cyber-attack is a firewall. The Federal Communications Commission (FCC) recommends that all SMBs set up a firewall to provide a barrier between your data and cybercriminals. In addition to the standard external firewall, many companies are starting to install internal firewalls to provide additional protection. It’s also important that employees working from home install a firewall on their home network as well. Consider providing firewall software and support for home networks to ensure compliance. 2) While small businesses often operate by word of mouth and intuitional knowledge, cyber security is one area where it is essential to document your protocols. The Small Business Administration (SBA)’s Cybersecurity portal provides online training, checklists and information specifically to protect online businesses. The FCC’s Cyberplanner 2.0provides a starting point for your security document. Consider also participating in the C3 Voluntary Program for Small Businesses, which contains a detailed toolkit for determining and documenting cyber security policies. 3) With 59 percent of businesses currently allowing BYOD, according to the Tech Pro Research 2016 BYOD, Wearables and IOT: Strategies Security and Satisfaction, it is essential that companies have a documented BYOD policy that focuses on security precautions. With increasing popularity of wearables, such as smart watches and fitness trackers with wireless capability, it is essential to include these devices in a policy. Norton by Symantec also recommends that small businesses require employees to set up automatic security updates and require that the company’s password policy apply to all mobile devices accessing the network. 4) Employees often wear many hats at SMBs, making it essential that all employees accessing the network be trained on your company’s network security policies. Since the policies are evolving as cybercriminals become savvier, it’s essential to have regular updates on new protocols. To hold employees accountable, have each employee sign a document stating that they have been informed of the policies and understand that actions may be taken if they do not follow security policies. 5) Yes, employees find changing passwords to be a pain. However, the Verizon 2016 Data Breach Investigations Report found that 63 percent of data breaches happened due to lost, stolen or weak passwords. According to the Keeper Security and Ponemon Institute Report, 65 percent of SMBs with password policies do not enforce it. In today’s BYOD world, it’s essential that all employee devices accessing the company network be password protected. In the Business Daily article “Cybersecurity: A Small Business Guide,” Bill Carey, vice president of marketing and business development at Siber Systems, recommended that employees be required to use passwords with upper- and lowercase letters, numbers and symbols. He says that SMBs should require all passwords to be changed every 60 to 90 days. 6) While it’s important to prevent as many attacks as possible, it is still possible to be breached regardless of your precautions. The SBA recommends backing up word processing documents, electronic spreadsheets, databases, financial files, human resources files, and accounts receivable/payable files. Be sure to also back up all data stored on the cloud. Make sure that backups are stored in a separate location in case of fire or flood. To ensure that you will have the latest backup if you ever need it, check your backup regularly to ensure that it is functioning correctly. 7) It’s easy to assume that your employees know to never open phishing emails. However, the Verizon 2016 Data Breach Investigations Report found that 30 percent of employees opened phishing emails, a 7 percent increase from 2015. Since phishing attacks involve installing malware on the employee’s computer when the link is clicked, it’s essential to have anti-malware software installed on all devices and the network. Since phishing attacks often target specific SMB employee roles, use the position-specific tactics outlined in the Entreprenuer.com article “5 Types of Employees Often Targeted by Phishing Attacks” as part of your training. 8) Regardless of your preparation, an employee will likely make a security mistake that can compromise your data. In the PC Week article “10 Cyber Security Steps Your Small Business Should Take Right Now,” Matt Littleton, East Regional Director of Cybersecurity and Azure Infrastructure Services at Microsoft, says using the multi-factor identification settings on most major network and email products is simple to do and provides an extra layer of protection. He recommends using employees’ cell numbers as a second form, since it is unlikely a thief will have both the PIN and the password. Security is a moving target. The cyber criminals get more advanced every day. In order to protect your data as much as possible, it’s essential that each and every employee make cyber security a top priority. And most importantly, that you stay on top of the latest trends for attacks and newest prevention technology. Your business depends on it. Here at AYS, our proof is in the pudding- and because we're a locally owned and operated company, our reputation is everything. We love what we do here down to a person, because we have all had experiences dealing with less-than-honorable companies in the past. We've taken lessons from our previous experiences not only in what to do and how to act, but what not to do and how not to act. We understand that business ownership and operation is a risk. As a local company, too, we want to help others like us. We take our greatest satisfaction in our work from knowing that we serve as a trusted advisor in the community, and we plan to continue to do that work for years to come. Thank you for your support! Summer Is Here, and SonicWall is on the Road! It is summertime in Rochester once again, and the folks over at SonicWall have hit the road once again to show their partners and vendors- AYS among them- what is in store in terms of developments and upgrades to their services and upgrades to their services and products in the coming year. They have really rolled out the red carpet for this RoadShow, and AYS will be there for your updates and inquiries regarding what SonicWall can do for you. As a business owner, your main concern should be running your business- not stressing about the multitude of threats that face your enterprise in the cyber world. That's why our friends over at SonicWall release a year Cyber Threat Report, which advises partners and business owners on the up-to-date threats presented in the IT sphere and exactly what should be done to counter them. And learn what you must do with a verified partner and re-seller like AYS Technologies in order to really understand what can be down efficiently and affordably to ensure your personal and private information and systems are safe. BIG NEWS ALERT: The Small Business Essentials Package Has Arrived! THE BIG NEWS HAS ARRIVED: AYS TECHNOLOGIES NOW OFFERS AN AFFORDABLE MONTH-TO-MONTH SMALL BUSINESS ESSENTIALS PACKAGE! For the last year and a half, we have been hard at work devising a way for smaller businesses to attain the "big three" of IT security essentials at a low monthly cost. 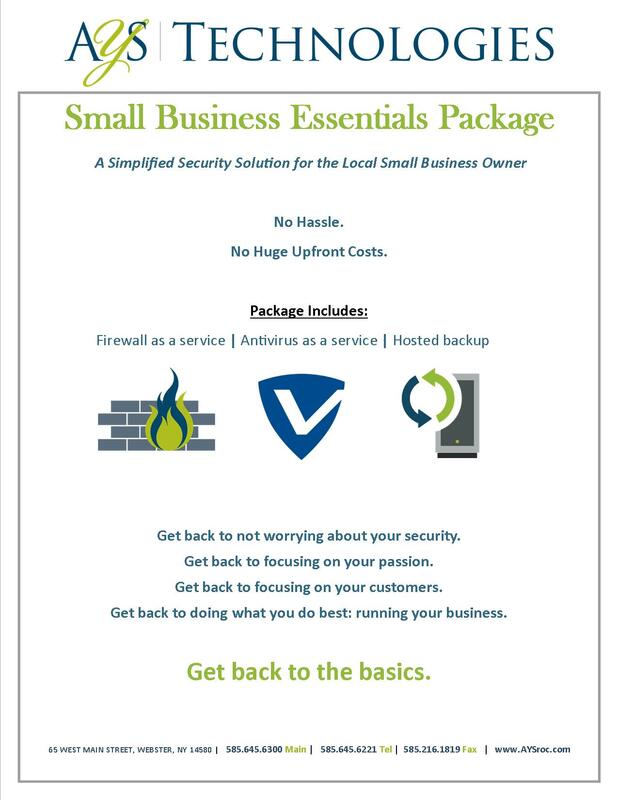 These three essentials- antivirus software, hosted backup, and firewall- are what every business needs in order to ensure the security of their information. We've finally managed to do it- with the help of our trusted partners and vendors, of course. Give us a shout if you're interested in hearing how we can provide these three necessities to your business, regardless of size. Don't get caught wanting in your time of need! We have some huge news coming. We're really excited. We hope you folks love it. It's been in the works for a really long time! Standby for a big announcement sometime in the next week- this is going to be the hottest thing since sliced bread. You'll find our recommended choices on both of these topics below. First dilemma: Keep IT entirely in-house, or outsource to a professional IT company? Decisions, decisions. It can seem like the better option to keep an on-site IT team as employees of your company; who would want to bring in outside companies for your company's system security, anyway? It seems like a very personal thing to have outsourced. However, a professional company with a solid reputation can help you stay ahead of the curve in a few areas. It's easier on the wallet. Outsourcing IT can be more cost-friendly than keeping an IT team on-site, often by an order of magnitude. Who doesn't like the prospect of saving on cost? It frees up effort and energy for other aspects of your business. Outsourcing IT keeps that aspect of your business off your plate, allowing you to divert the energy, time, and resources of employees that otherwise would be addressing tech maintenance to doing what you originally got into business to do: deliver quality services or products and expand your business. It keeps you on the forefront of security and innovation. Information technology is a constantly changing and evolving field. The fluidity with which technologies become either relevant or obsolete is alarming, and the rate at which technologies change is only expected to increase. By outsourcing your IT services, you will be able to stay on the forefront of technological relevance, which means more security for your business and, most importantly, your customers. It allows you, as an owner, to refocus attention to your customers. You entered business and founded a company in order to first and foremost service your customers. Outsourcing IT is the responsible choice- because a well-maintained IT system keeps your customers secure and safe. Second dilemma: Preventative maintenance, or break-fix? More often than not, the perceived best-practice when it comes to maintaining your company's technological security is initial setup followed by a policy that professionals in our field refer to as break-fix; that is, once the IT framework and system are established, services are only required when hardware or software needs to be updated, is past due for updates, or flat-out breaks. While this is lower in cost, the ramifications of this choice can be more serious than originally perceived. Software or hardware malfunctioning or breaking could mean lapses in services or, even worse, interrupted security for your customer's data. This could, in the long term, harm your reputation as a company with your current and prospective customers alike. What, then, is the alternative? 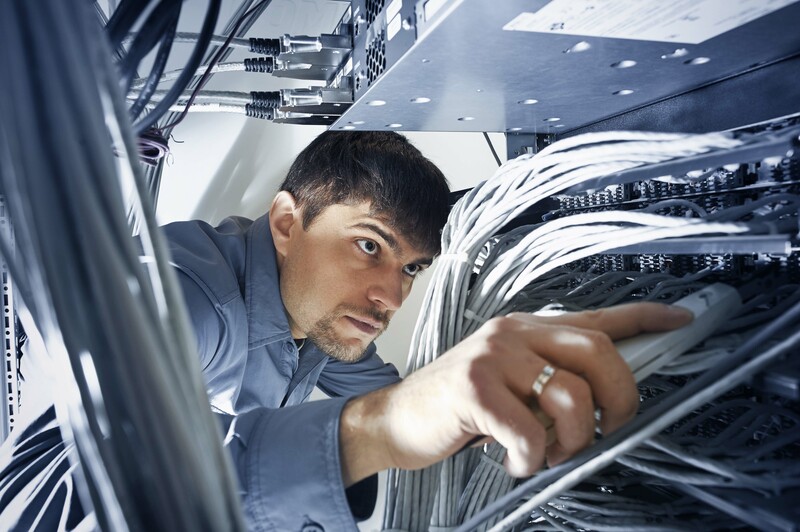 Preventative maintenance, or managed onsite services, occurs when you hire a company to dedicate a certain amount of time each month to work onsite at your company and perform function checks, security updates, and inspect your hardware. In layman's terms, this is buying the flood insurance before the flood, not after- as in the case of break-fix policies. In short, no one wants to be caught in a situation where their IT system goes down or malfunctions, because it could disrupt your ability to communicate with customers, keep their personal information safe, and provide uninterrupted services to clients. While managed onsite services can be more expensive in the short-term, it is guaranteed to save you time, money, and- most importantly- reputation, in the long-term. Small Business Month at AYS Technologies- and We Are On Instagram! May is small business month at AYS Technologies. And because of that, we will be releasing some awesome new content and a HUGE update on our offered services to you- the SMALL BUSINESS- to show you how much we care. Without the support of local small businesses, we wouldn't be who or where we are as a company, and that is the honest truth. For what it's worth, AYS Technologies is a small local business as well- so it just so happens to be our wheelhouse. Keep checking up here and on our social media posts in the next month to get an idea for what we are doing for local businesses around the Greater Rochester area... we think you'll be pleasantly surprised. Also, we are live on Instagram! Follow us on Insta at atyourservicetechnologies for funny pictures of Zach, Kev, and the boys- we promise you won't be bored. Hey there again from all of us at AYS Tech! As our company has grown over the last few years, we’ve been able to see the positive impact our work has on YOU- our friends and clients. In that respect, we are so grateful as a company for your business and support, and we look forward to continuing to provide excellent service for years to come. We have friends and clients like you refer other businesses frequently, and as such, we’ve decided it’s high time you benefit from that, too. Refer a friend, and if they come onboard with AYS Tech we’ll hook you both up with a credit to your monthly bill when they sign up for proactive services with us. It’s as simple as that! We want to continue to grow as the neighborhood provider for outsourced IT services in the area- being “just down the street,” we- and you- understand that integrity in everything we do gives us the edge over all others. So, from the bottom of our hearts: thank you again for your loyalty, and the trust you place in our hands every day to take care of the most crucial aspect of your business. Before making any technical decision in healthcare, you can be sure that HIPAA will need to be considered. HIPAA violations can result in hefty fines, legal action, and significant damage to your organization’s reputation and credibility. While you may think implementing your backup solution by yourself due to budget restraints, regulatory concerns may have you considering a managed approach. Cloud managed service providers can keep you in check with HIPAA and application monitoring; services that you may not be able to find in your own IT department. Your data recovery system isn’t just equipped to recover massive amounts of data; it also needs to focus on the loss of individual files and smaller data sets. Recovery solutions often copy data as one single file, which means that if you’re looking for one single file you’ll experience something not unlike searching for a needle in a haystack. In public cloud, with the ability to copy over data in its original configuration, you won’t have to worry about any of that. The times of a backup being an optional feature are very close to coming to an end. 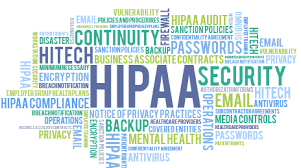 It is necessary to consider the idea that within the year, it will be law to require a data backup if your firm or company operates in the healthcare field. With the advent of Cloud backups, there is really no reason not to have the contingency in place. Today, SonicWall made a landmark announcement in the launch of the innovative SonicWall Capture Cloud Platform. Complemented by a host of new products, services and capabilities, the Capture Cloud Platform tightly integrates security, management, analytics and real-time threat intelligence across our full portfolio of network, email, mobile and cloud security products. The new Capture Cloud Platform ensures you are always protected by the absolute latest threat intelligence — updates, signatures and alerts — to automatically defend your networks, data and other sensitive information from today’s most advanced cyber attacks. The ability to backup to the Cloud remotely is an awesome development- it means that there is no reason not to have a backup in the rising age of ransomware threats. Nearly sixty percent of the American business workforce works remotely- that is, outside of traditional office spaces. Every day, we log into laptops at cafes and airline terminals, dialing into conference calls and video'ing from the kitchen table. This is a new norm- but how does security factor into this? First, it's important to remember to make your passwords as complex as possible within the realm of being realistic for the sake of your own memory. In short, don't make them a single word! Second, don't stress too much when browsing the web on an unsecured network- but be shrewd regarding the websites you visit. "Oops-clicking" is a real thing- so don't click on a pop-up ad hoping to dismiss it. It may trigger a malware download. Additionally, software like SureClick from HP will isolate each browser tab as if it were in a virtual sandbox, so to speak, so anything that you click on that IS malicious won't reach the rest of your PC. Third, consider using a privacy screen on your PC. This deters people from "helicoptering," or "shoulder surfing," which means actually snooping over one's shoulder to lift sensitive information. Privacy screens make it so that unless someone is sitting in the primary position in front of the PC's screen, they won't be able to see anything. Lastly- pay attention to when your camera is on or off-- and control what it could see even when you think it is off. Simply placing a piece of solid-colored tape or paper over your camera when it is not in use (or buying a fancy camera shutter) will ensure that anyone accessing your camera remotely will not be able to see you or the work that you are doing. April is the best month of the year for the AYS team. Want to know why? Because April is AYS's Backup Month. All month, we are going to be showing you guys the importance of backing up your information and data- especially in light of breaches like the ones at Lord and Taylor and Saks Fifth Avenue. To kick off our month, here are five reasons you, as an employer, should back up your employee's PERSONAL computers. 1) Protection for Important Data- Almost everything your employees do, they do on their computers. Your users and company couldn't function without PC's. Up to 80 percent of vita company data is kept on PC's- so why not secure that? 2) Safety for Ransomware Infection- In 2016, nearly 50 percent of organizations in the US were hit with ransomware, with an average ransom of $679. Industry experts predict that the threat is only going to grow, and the only assured recourse to recover PCs from ransomware infections is a good backup. 3) Efficiency with Storage Deduplication- "Storage De-what-now?" In IT, data deduplication is a specialized data compression technique for eliminating duplicate copies of repeating data. Many employers and companies cite lack of storage capacity when justifying the absence of PC backups. Network bandwidth concerns abound as well. However, this issue is easily mitigated with data deduplication. Usually your employee's PCs will have a lot of common data like operating systems and applications. This makes deduplication very effective- and can reduce your storage capacity requirements by an order of magnitude. No excuses not to have a backup then, folks! 4) Mobility with Cloud Storage- Many employers utilize remote or mobile employees; the perfect solution for them would be to store backups in the Cloud, instead of backing up data to your office via a VPN. The data can be securely encrypted at-source- so it will be safe in-flight and at-rest. 5) Productivity with Ease of Recovery- With a backup, if a file is lost or encrypted by ransomware, it can be restored with a few simple clicks. If the system has crashed entirely, you can restore the full image as well. With very little effort on your side, you will be more productive, secure, and successful. Take these steps and sleep better at night! See you guys soon! While institutions are continuously adapting to the latest cybercrime techniques, the first line of defense is at home. Here are a few tips you can employ in the comfort of your own home to remain secure. 2) Verify virus alerts- don't call that 800-number to verify, but instead a trusted source! 3) Update your software by setting your system to auto-update! 4) Beware of phone scams- remain suspicious if a number you don't know calls! 5) Reset your passwords frequently! From all of us here at AYS, stay secure and stay safe! The "If" mindset is one that we at AYS Technologies caution against employing when it comes to your system security. Let's have a quick chat about this. Say that you live in a gulf coast state, and you've just opened a small business. Would you purchase flood insurance for that business? Sure you would. Why? Because hurricanes are likely in the area of the United States where your business is located. How about if you lived in Oklahoma? Would you buy home insurance that covers damage due to tornadoes? Of course! Why? Because in Oklahoma, tornadoes are a "when" circumstance, not an "if" circumstance. One more. If you lived in New York City and owned a car, would you make sure your auto insurance covered collision? You definitely would. Why? Because in New York City, it's not a matter of "if" that taxi is going to rear end you on icy roads, it's a matter of "when." The same mindset should be applied for system security. If you operate a business that handles private information- credit card info, health records, etc.- at all, it is not a matter of "if" you will be hit from an attack, it's a matter of "when." It's just that simple. Outsourcing your IT services to a trustworthy local company is buying that insurance in tornado country. It is having collision in the big city. It is purchasing flood insurance before the hurricane. 1) Threats can enter networks in a variety of ways; to mitigate these risks, consider deploying solutions to secure multiple threat vectors, such as email security and a next-generation firewall. 2) Do your part in educating fellow users on how to detect common email threats. Phishing attacks continue to evolve, and most are incredibly hard to detect. By doing research on best practices to mitigate phishing attacks, you too can educate your friends and peers at work to mitigate this issue. 3) Keep your systems updated by employing the use of an outsourced IT company to spend a few hours a month on-site. This takes the worry of staying up-to-date out of your mind, and allows experts to keep you safe. 4) Change your default passwords frequently. 5) Employ the use of a good data backup. If you don't have one and your system is spiked, that data is gone- forever. In layman's terms, buy the flood insurance before the flood occurs. Keep in mind: these days 70 percent of ransomware attacks target small businesses, so if you think you're safe because you're a smaller entity- you're not, but it's never too late to take steps to become so. 2) Crypto ransomware, which targets the data and file systems on the device versus the device itself, so the computer is functional except the ability to access the encrypted files. Since 2013, the amount of detected ransomware in systems of healthcare companies across the United States has jumped from 4.8 million to 18.3 million. Ransomware attacks on hospitals across the country have increased, putting the personal data and information, including financial data, at risk. Servers are commonly held ransom, lasting in duration from hours to days, leading to thousands of personal records being breached at a time. "There needs to be a fundamental shift in our thinking about security today. More priority needs to be given to detection and response, but detection and response without protection will be less effective and can fail." We at AYS technologies couldn't agree more. Leave it to us- the experts- to keep your security up-to-date. For companies in the healthcare field especially, the time is near that outsourcing IT and system security will be not only recommended, but mandatory by law. 2) Build a “human firewall” by teaching your employees, especially those dealing with payments, how to deal with potential threats, such as malicious emails and suspicious pop‐ups. 3) Deploy a next‐generation firewall that is capable of high‐performance (SSL/TLS) Secure Sockets Layer/Transport Layer Security inspection enabled to ensure you are able to inspect all traffic regardless of ports, protocols or file size, decompressing and decrypting every packet and examining every byte to identify threats quickly. 4) Standard sandboxing solutions do not catch encrypted malware since they cannot see inside encrypted traffic. SSL/TLS inspection is a necessity, as is a network sandbox that will block traffic until it reaches a verdict and not only detect zero‐day attacks but prevent them in an automated fashion. 5) Add content filtering to keep users from visiting dubious sites, and use a gateway anti‐virus and intrusion prevention system to protect them from compromised “good” sites. 6) Deploy an enforced endpoint solution so you can detect a system that’s been compromised outside the network and flag it for remediation. 7) Keep all software, including browsers, operating systems and firmware, up‐to‐date with security patches. 8) Update your security settings to increase browser security levels. Also, be sure to restrict Microsoft Office files containing macros. 9) Isolate the corporate network environment into private and public zones and implement multifactor authentication for cross‐visiting. Isolate critical systems, Internet of Things (IoT) devices and POS systems as well. 10) Invest in managed security services. We at AYS Technologies specialize in helping local businesses step away from worrying about these issues by maintaining the security and integrity of your system for you, in order to let you focus on what you do best. In short, the existence of Spectre and Meltdown could mean that possible attackers have a new avenue to obtain information previously considered completely impervious to attack. As we mentioned, the consequences could be gravely serious. However, good news exists, and it is directed toward those utilizing SonicWall for their primary IT protection method: SonicWall recently released a notice stating that those using their software have no need to worry about the Spectre/Meltdown vulnerability, as all SonicWall products and services have been tested and confirmed to hold strong against any possible vulnerability exploitation. Fear not, SonicWall customers. They’ve got your (and your data’s) back.